In 2016 we launched a campaign to help #StopMomShaming. To encourage support and acceptance among the mom community. To ensure that moms know that they are appreciated for their A+ effort and their loving intentions. To create a space online where moms can get the support they need without the judgement they don’t. We just get mom life. And we know that, as moms, we all have enough worry and guilt plaguing our minds without letting what other moms think about what we do or don’t do when it comes to raising our babies get to us. As hard as we’re working to change the mom shaming game, we know it still happens and we hate that. We’ve thought about starting our own Ain’t No Shame in Our Mom Game Brigade where we roll around in a tricked out RV filled with delicious snacks and fresh beats and confront mom shamers face to face, but it hasn’t worked out yet logistically. In the meantime, we want to empower you so you can face those shamers head on and not let them get in your head. Mom shamer is just a code word for big bully and, just like you tell your kids to stand up to bullies, you need to as well. It’s scary, and it’s hard, but it’s what’s right. Now, we don’t mean you need to be mean, in fact, we know that won’t work. Instead, look your shamer in the eye and tell her in no uncertain terms that you are doing the best job you possibly can and her mean, judgmental words are not helpful. They’re trolls and you need to be a bigger person. Because trolls are little people and being bigger than them is not even that hard. Ignore it if you want to. Or, laugh. Humor is the best medicine. When you see someone being shamed online, show them your support. Be positive, say something kind, show the shamer their words are not welcome up in here. It’s sort of a shame the shamer technique only they deserve it for being mean. 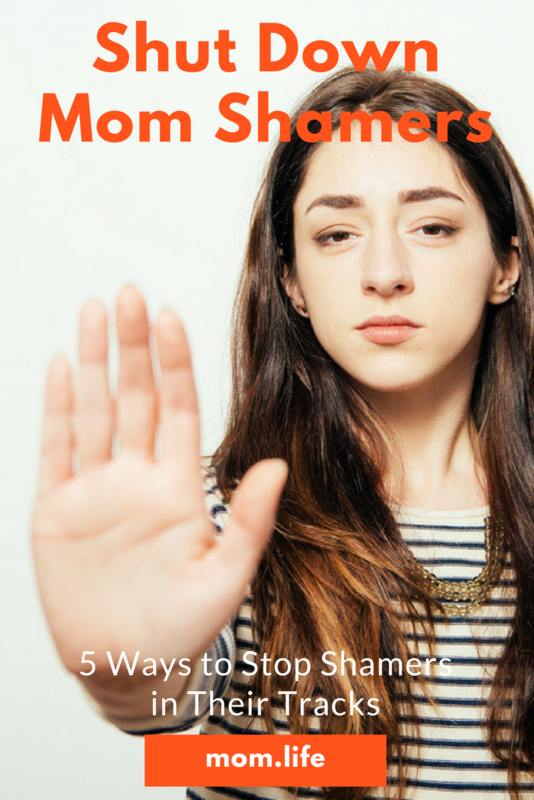 Surround yourself with like-minded people who know that mom shaming is seriously uncool. The mom.life app is the perfect place! Our community is filled with supportive moms who really want to help each other. They know the struggle because they’re all living it and they come into the app to find like-minded people. It’s a safe space and we make sure of it by moderating it to prevent any trolls from sneaking in and shaming our moms. We gotchu boo, don’t you worry. Read more: See how this mom got shamed for breastfeeding in public.